The main difference between Spark and Scala is that the Apache Spark is a cluster computing framework designed for fast Hadoop computation while the Scala is a general-purpose programming language that supports functional and object-oriented programming. Apache Spark is an open source framework for running large-scale data analytics applications across clustered computers. It can handle both batch and real-time analytics and data processing workloads. On the other hand, Scala is a programming language. It is compiled and run on Java Virtual Machine (JVM). Scala improves productivity, application scalability and reliability. In brief, Scala is considered as the primary language to interact with the Spark Core engine. 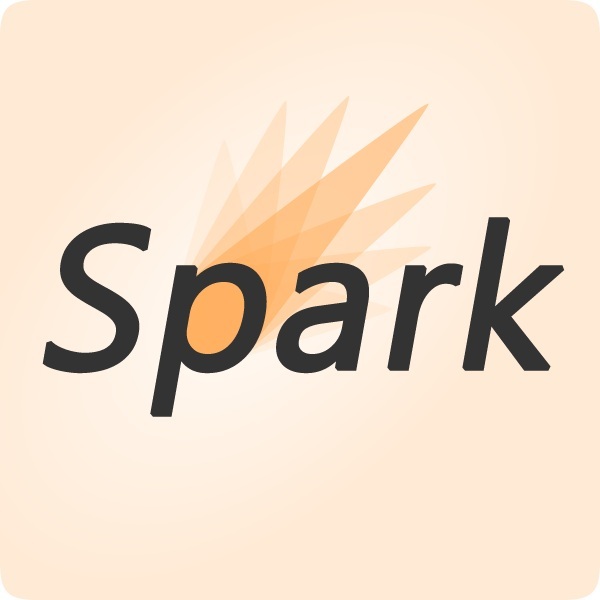 Spark was introduced by the Apache Software Foundation to increase the Hadoop computation process. It consists of in-memory cluster computing to increase the processing speed on an application. Spark is based on Hadoop MapReduce, and it extends the MapReduce model to perform multiple computations. It also includes interactive querying. Spark provides multiple advantages. It allows running an application on Hadoop cluster much faster than running in memory and on disk. It also reduces the number of read and write operations to disk. It supports various programming languages. It has built-in APIs in Java, Python, Scala so the programmer can write the application in different languages. Furthermore, it provides support for streaming data, graph and machine learning algorithms to perform advanced data analytics. Scala is a hybrid functional programming language. It has features of object-oriented programming and functional programming. As an Object Oriented Programming Language, it considers every value as an object. The subclasses can extend classes. Moreover, there is mixing based composition for inheritance. As a functional programming language, it defines anonymous functions, supports higher-order functions and nested functions. Scala is statically typed. The programmer does not need to specify a type in most cases. Similar to Java, the Scala source code is converted into bytecode, and this bytecode is executed by the Java Virtual Machine (JVM). It is easier for a programmer to change from Java to Scala and vice versa. Scala can execute Java code. It allows using Java SDK classes and the custom Java classes. Furthermore, Scala supports concurrent and synchronized processing. Scala can be used to analyze data with Spark. In other words, Scala is one language that is used to write Spark. Spark is an open-source distributed general-purpose cluster-computing framework. Scala is a general-purpose programming language providing support for functional programming and a strong static type system. Thus, this is the fundamental difference between Spark and Scala. Spark is used to increase the Hadoop computational process. Scala can be used for web applications, streaming data, distributed applications and parallel processing. Hence, this is also an important difference between Spark and Scala. 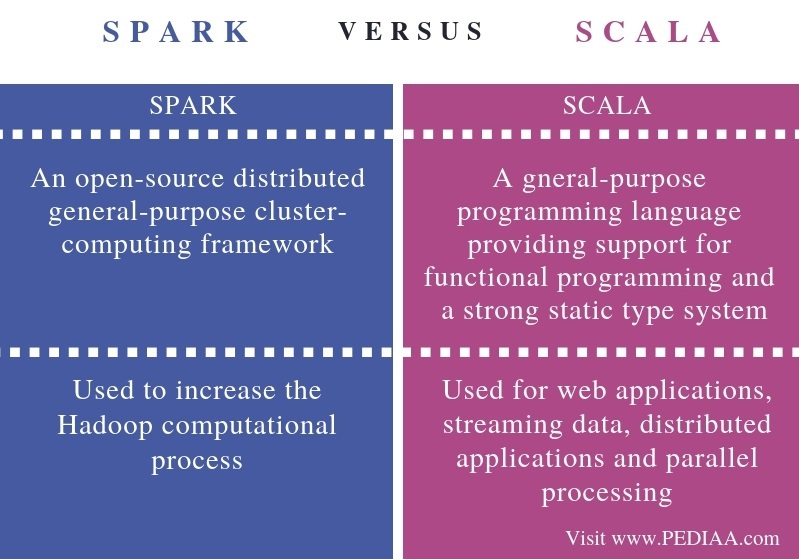 The difference between Spark and Scala is that th Apache Spark is a cluster computing framework, designed for fast Hadoop computation while the Scala is a general-purpose programming language that supports functional and object-oriented programming. Scala is one language that is used to write Spark. 1. “Apache Spark Introduction.” Www.tutorialspoint.com, Tutorials Point, Available here. 2. “Scala Overview.” Www.tutorialspoint.com, Tutorials Point, Available here. 3. “What Is Scala Programming – A Comparison between Scala vs. Java.” Intellipaat, 2 June 2018, Available here.